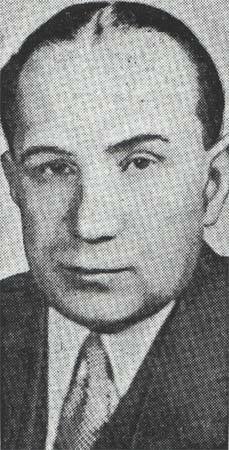 JOSEPH A. VARBALOW was born in Russia on January 15, 1896, along with his twin sister Anna. 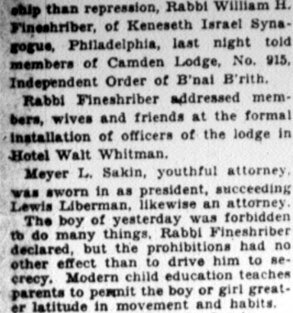 The family came to America in 1897 or 1898, and settled in Philadelphia PA. The Varbalows moved to Camden around 1905, and became involved in construction, realty, movie theaters, and a shoe business. 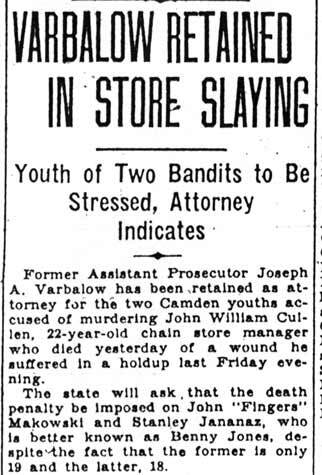 Joseph A. Varbalow graduated from the Camden Manual Training & High School ant Haddon and Newton Avenues in 1913. 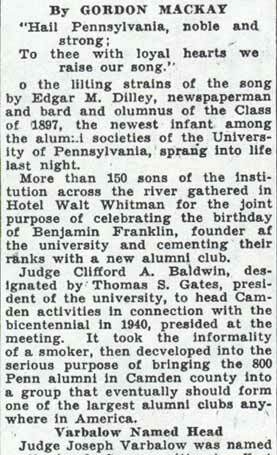 He graduated from the University of Pennsylvania Law School with high honors in 1917. 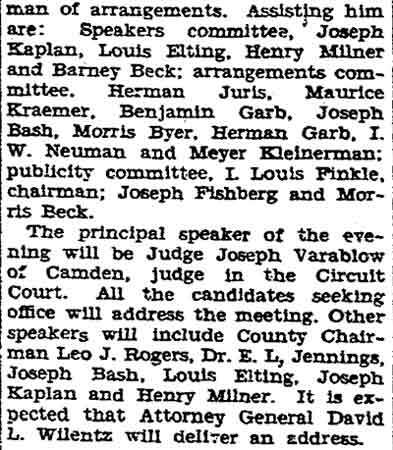 After clerking for Circuit Court Judge Frank B. Jess, Joseph A. Varbalow began practicing law in July of 1919. 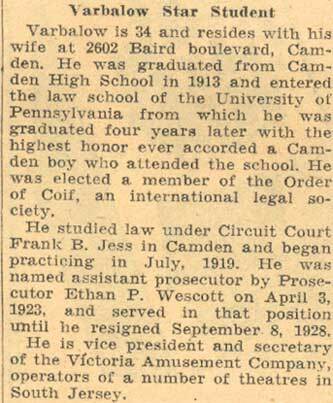 He partnered with Ethan P. Wescott, and was appointed on April 3, 1923 as assistant Camden County Prosecutor when Wescott became County prosecutor. 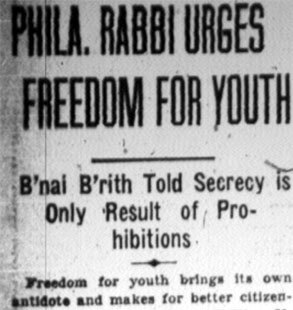 He would remain in this post until his resignation on September 8, 1928. He was succeeded in the position by Samuel P. Orlando. 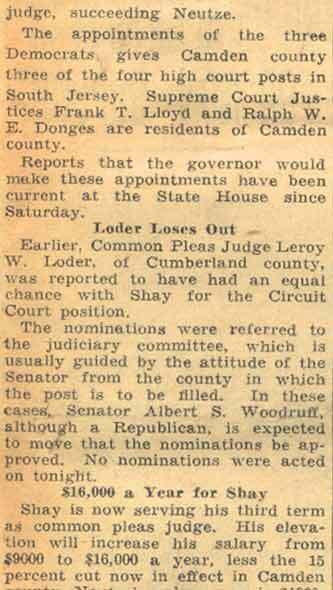 In May of 1934 he was nominated to serve as District Court judge in Camden, and he served as such for several years. 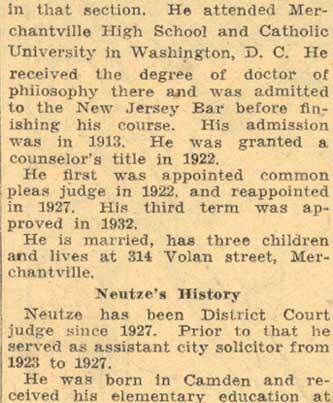 He later returned to private practice, and had offices at 636 Penn Street in Camden. 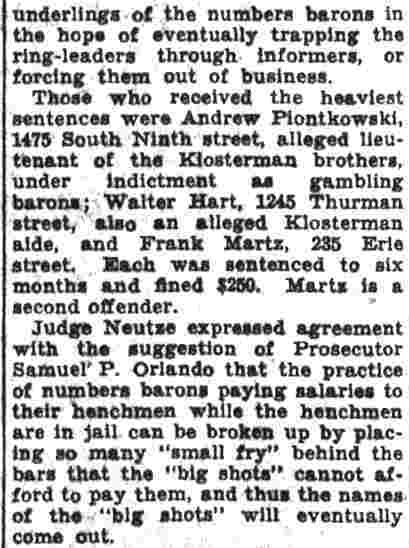 Joseph Varbalow was involved with several business and civic groups, and was active in the fund raising drive that culminated in the building of the Walt Whitman Hotel at Broadway and Cooper Street. 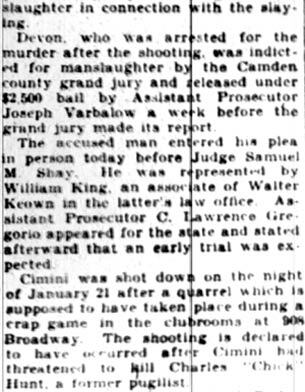 Joseph Varbalow also served as vice-president and secretary of the Victoria Amusement Company, which operated several theaters in South Jersey including the Victoria Theatre in East Camden and the Auditorium, later known as the Rio, in Cramer Hill. 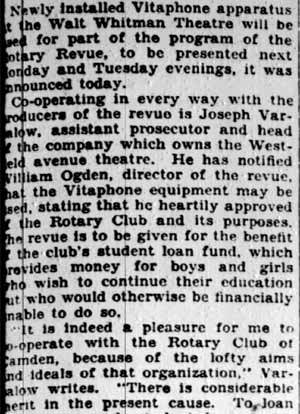 His brother Samuel Varbalow was the president of this firm, which evolved into the Savar theater chain. 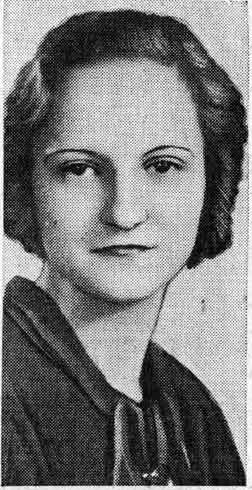 A sister, Fannie Varbalow, was married to Adolph Newmeyer, who operated a shoe store and at one time a bar in Cramer Hill. 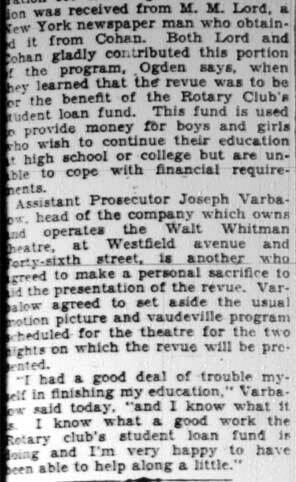 In 1928 Joseph Varbalow was the head of the company that operated the Walt Whitman Theater at 46th and Westfield avenue in Pennsauken NJ. 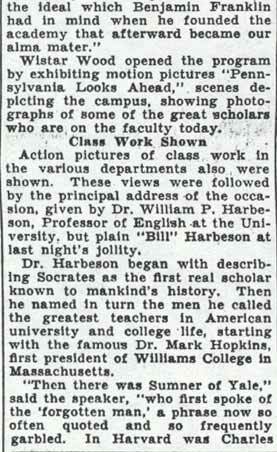 During this period the Walt Whitman became the first South Jersey movie house to show the new "talking pictures". 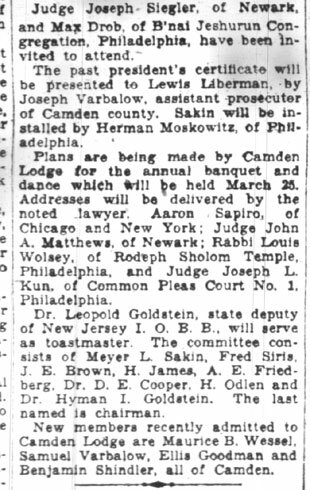 When East Camden began to develop, the Varbalow family was one of the prominent Jewish families to settle there. 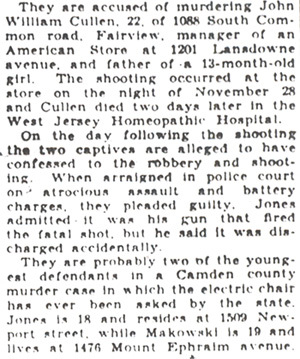 By 1930 the family had move to 2602 Baird Boulevard, where they would remain for many years. 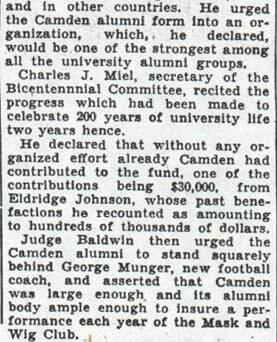 The next door neighbors at 2600 Baird into the 1940s was Camden builder Frederick Wielandt. 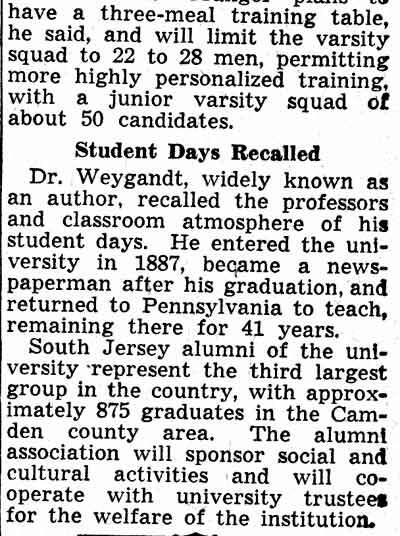 By 1959, Joseph A. Varbalow had moved to 320 West Maple Avenue in Merchantville NJ. 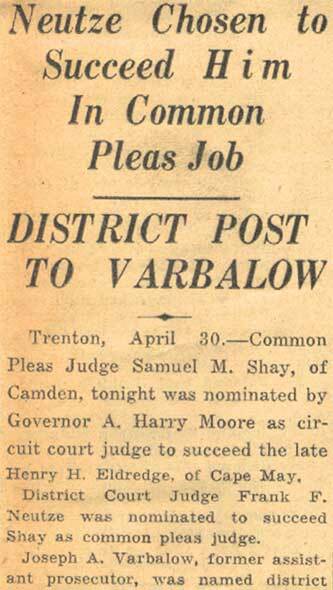 During the early 1930s Joseph A. Varbalow brought Firmin F. Michel, who had graduated from the South Jersey Law School in Camden in 1930, into his law practice. 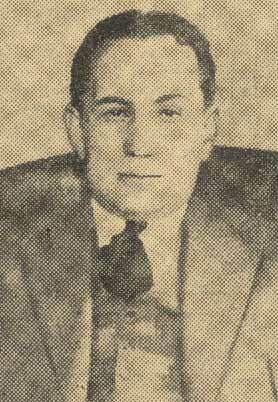 Michel would become Camden's City Solicitor in October of 1936. 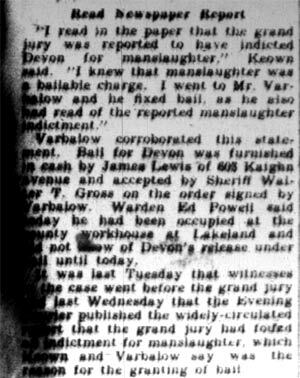 A resident for many year of Merchantville NJ, Joseph A. Varbalow passed away in March of 1969, survived by his wife Dorothy, who passed in August of 1977. An automobile accident damage suit was about to go on trial before Judge Henry H. Eldredge in Supreme Court here yesterday when it was announced a settlement had been reached. The amount of the settlement was not disclosed. Mary Madler, formerly of Camden, and now of 10 South Maryland avenue, Atlantic City, asked $10,000, and Abraham Snyder, 2055 East Pacific street, Philadelphia, asked $5000, for injuries they said they received. 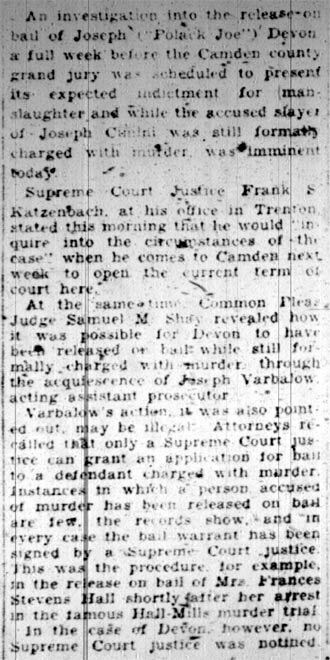 They sued Edna Trego, 651 Berkley Street, whose automobile was in collision with Snyder's car October 7, 1928, at Richmond and Norris Streets, Philadelphia.. Joseph Varbalow, counsel for the plaintiffs, announced the settlement when the case was called. 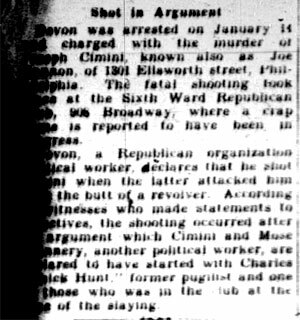 Tenth Ward Democratic Club, Camden, 822 North Eighth Street, Firmin Michel, Frank Connors, speakers. Woodrow Wilson Democratic Club, Atlantic and Louis Streets, Thomas Madden, speaker. A Democratic rally sponsored by the Audubon A. Harry Moore for Governor Club will be held tomorrow night in the auditorium at Fire Hall No 1. 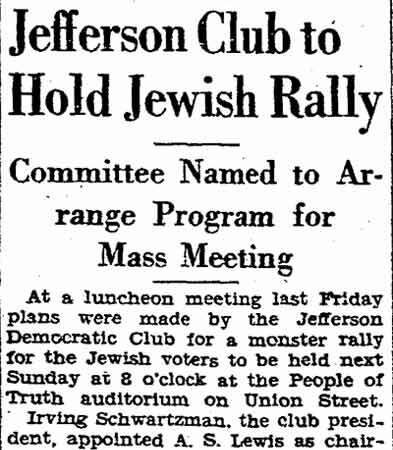 Prominent Democrats will speak. Among the local speakers will be Fred Lange, Democratic candidate for freeholder and former mayor of the borough. The Woodrow Wilson Democratic Club of Millville, which held a Moore rally last week, announced that another meeting will be conducted in St. Mary's Hall, Millville, Saturday night. Paraphernalia for Tuesday's general election will be distributed Monday among city election boards in the basement of the new city hall courthouse annex. The boards will receive the ballot boxes, official ballots, poll books, registration books, stationery, cards of instruction, and a copy of the 1931 amendments to the election laws. An enthusiastic Moore rally was conducted Tuesday night at the headquarters of the Haddon Heights Democratic Club, Station Avenue. 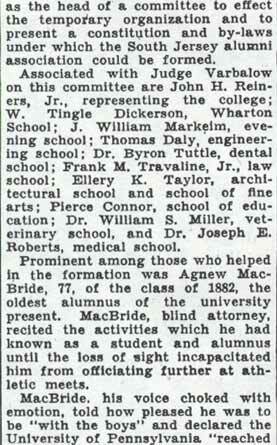 Joseph A. Varbalow and Mrs. Bertha Shippen Irving were among the speakers. 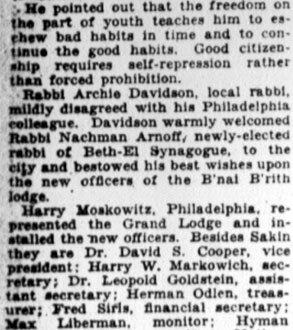 Varbalow today congratulated the club on its pretentious new quarters, a three-story building. Camden County Democratic freeholder candidates are circulating a pamphlet headed "Better Freeholders for Better Government," which, among other things, shows a cartoon of Baird, with the Republican candidate saying: "I can't understand why they don't like me. I've always been for the people." Boyd Morrison, editor of Labor journals, is working double-time, what with taking care of his journalistic endeavors and keeping his engagements to speak in behalf of the candidacy of A. Harry Moore for governor. 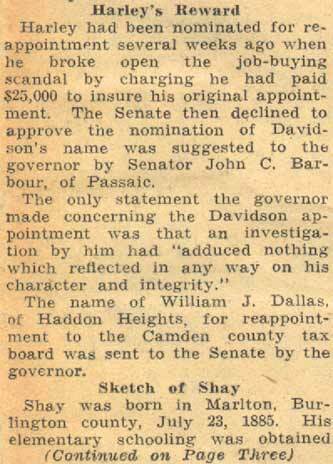 David H. Farries, known to the radio world as Dave Ferris at WCAU, is receiving many tan letters lauding his composition and singing of the Baird campaign song in South Jersey. 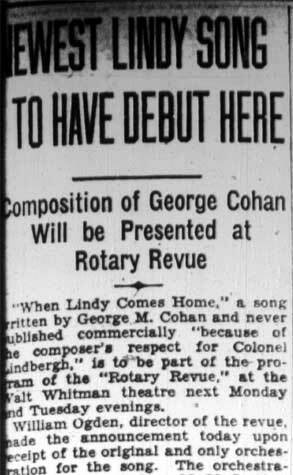 He asks the various audiences to join in the chorus. The radio songster also had the honor of writing a former campaign song for the late U. S. Senator Dwight W. Morrow. Ballot-counting election night is expected to be comparatively easy for city election boards. Voters in the city will ballot for governor, three assemblymen, two coroners, and for justices of the peace. 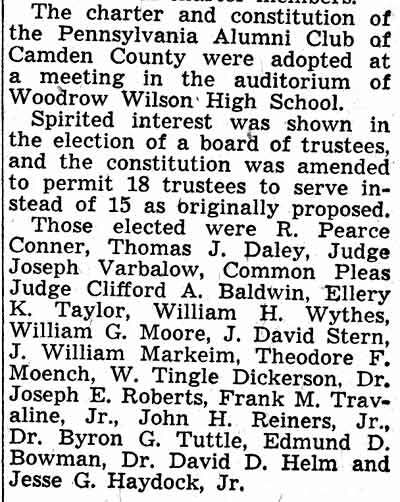 No more than eight offices are lo be voted for, and with many citizens expected to vole a "straight ticket," the returns in Camden are expected to be received early, with the first of them anticipated at city hall by 10 o'clock, two hours after the polls close. The polls open at 7 a. m.
Election districts in city and county total 263 for the general ejection, or three more than at the 1930 general election. The new voting districts are in the sixth district of the Eleventh ward, and one each in Laurel Springs and Delaware Township. Arguments will be heard tomorrow in U. S. District Court here by Judge .John Boyd Avis on fixing a date for the resumption of hearing testimony against Warner Brothers and 13 subsidiaries in a suit charging violation of anti-trust laws. The suit to restrain Warner Brothers interests was filed in Federal court last .January by the Victoria Amusement Company, independent owners of a chain of theatres in Camden and vicinity. Joseph Varbalow, part owner of the company and counsel, will ask the court to fix July 5 and 6 as days for taking additional testimony in the case, which has been postponed several times. 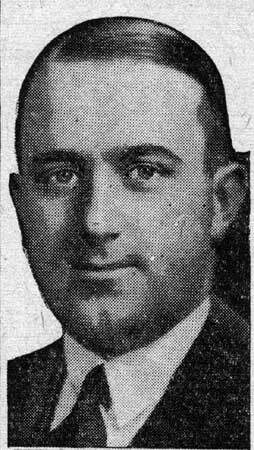 A. Merritt Lane, Newark, counsel for the Warner Brothers interests, will object to further testimony being taken until September. In affidavits filed with the court yesterday he states that he understood the case was not to be reopened until the Fall and he has arranged to take a Mediterranean cruise beginning July 1. Actual trial of the case has not been started as Warner Brothers have filed a bill of appearance, contending Judge Avis lacks jurisdiction in the matter because the contracts for New Jersey theatres owned by the defendants are signed in home offices in other states. 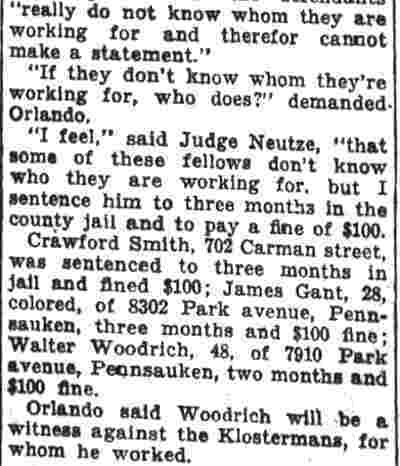 Lane contends the New Jersey, theatres merely apply for picture contracts and they do not become legal until approved by the home office in New York. Lane lost a legal skirmish when Judge Avis refused to permit the transfer of the case to the U. S. courts in New York for the taking of testimony. The Victoria Amusement Company ,contends that Warner Brothers interests exercise an unlawful monopoly and restraints in distributing 100 motion pictures. It is charged favoritism is shown Warner Brothers theatres over independents, in violation of the Sherman and Clay anti-trust laws. 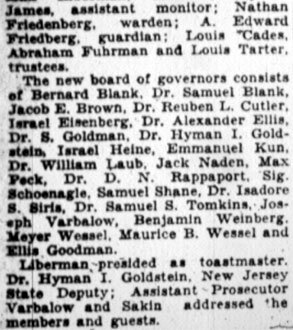 Thirteen subsidiaries of' Warner Brothers and, Albert Warner have been cited to appear tomorrow by Varbalow, who will have Congress man Charles A. Wolverton and Harvey F. Garr, as associate counsel. 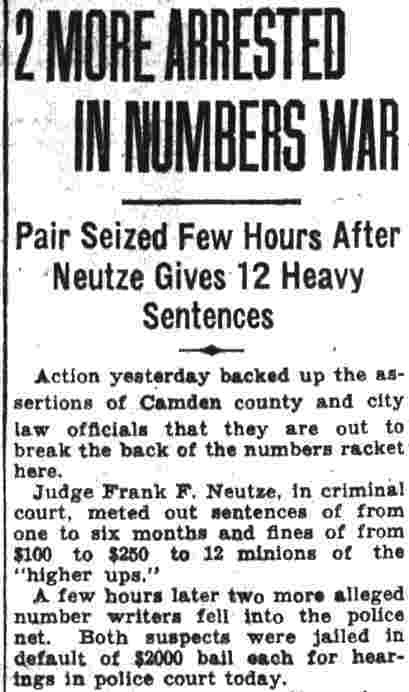 Among the defendants are the Stanley Company of America, First National Pictures Distributing Corporation, Vitagraph, Inc., First National Pictures, Inc., Warner Brothers Theatres Inc., and Stanley Company, of Camden. 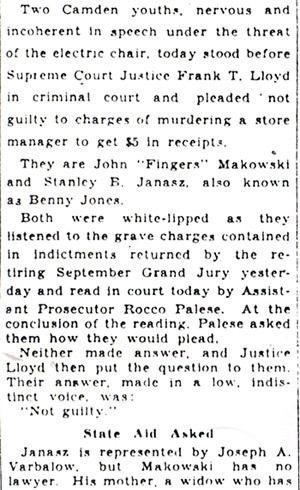 A number of secondary defendants are mentioned. When Mikey Brown, former stormy petrel of Eighth ward politics, moved to Runnemede recently he thought his appearances in Camden courts were over. But it was not to be. Mike, who is engaged in the fertilizer business, appeared before Judge Joseph Varbalow in District Court yesterday on complaint of Ross J. 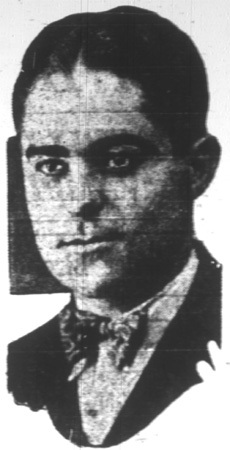 Brown, of Mendenhall, Pa., near Villanova. 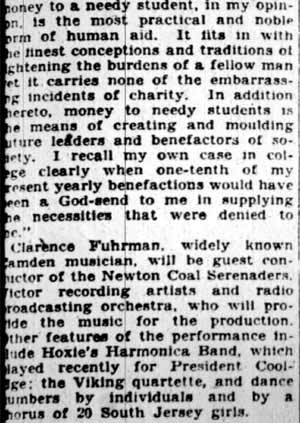 The Mendenhall Brown claims that on November 14, 1934, he paid the Runnemede Brown $712 for fertilizer. Mikey delivered $462 worth, and refused to deliver the rest, according to the complainant. Ross Brown demanded his $250 worth of fertilizer or the money back. Mikey Brown, in a counter-claim, said Ross owes him $489 for fertilizer he delivered and for which he never was paid. Judge Varbalow dismissed the counter-claim and gave Ross Brown a judgment for the $250. The Browns, incidentally, are not related. Edward Martin, sergeant-at-arms in the Camden District Court, has been suspended by Judge Joseph Varbalow on charges that he attempted to hold up a court order, and used profane language in a public office. The suspension is indefinite, Judge Varbalow said, until he "turns the matter over to see if any further punishment should be given. Martin had no comment to make when questioned on the suspension. Judge Varbalow said the charges arose over a case in his court involving Frank Schofield and James Pennington. 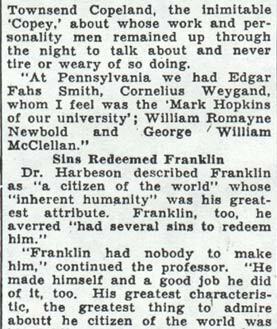 The former had obtained an attachment on funds of Pennington, who is leader of an orchestra known as Pennington's Californians. 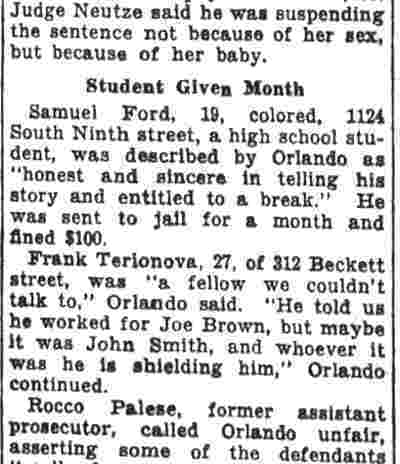 "When the case came up for a hearing in my court," Judge Varbalow said, "Schofield, who was the plaintiff, failed to appear. I then I signed an order directing the clerk of the court to return the money held up in the attachment, to Pennington. 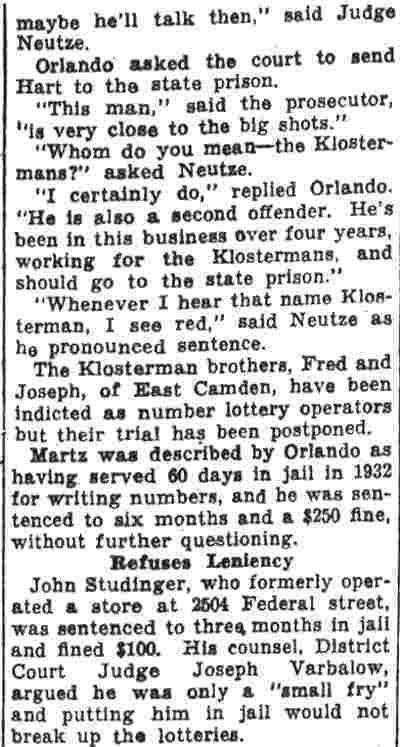 "Martin acted as a constable in the matter. 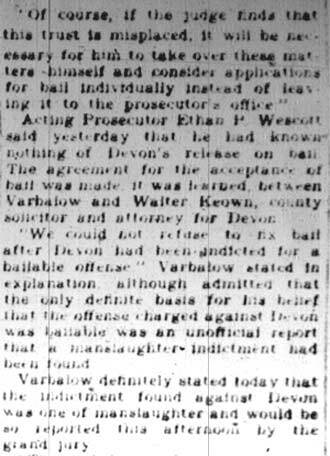 He went to the clerk, Charles Ferat, and told him to hold up the order for an hour or so, until he, Martin, could get in touch with Schofield's counsel, Rudolph Eisener," Judge Varbalow continued. 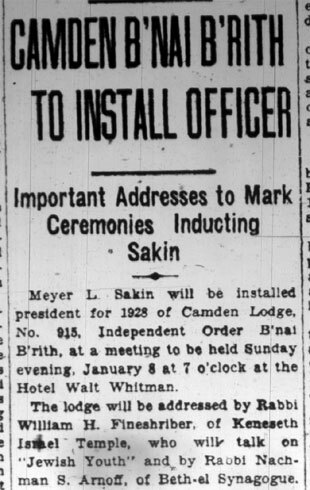 "Ferat refused to hold up the order, and Martin called him a profane name. The matter was reported to me and I summoned Martin, Ferat and two other witnesses to my office on Saturday. "At that time Martin admitted he had made a mistake and said he was sorry it had happened. He said he meant no wrong by his actions. 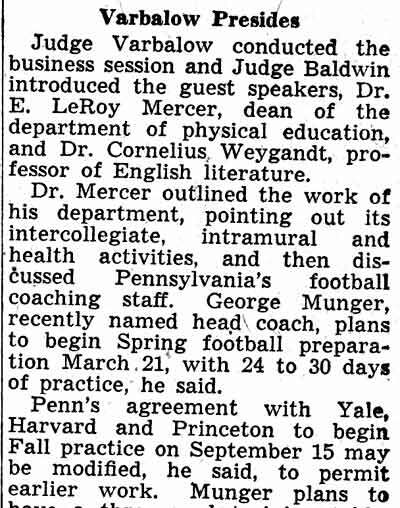 "I have suspended Martin for two reasons. 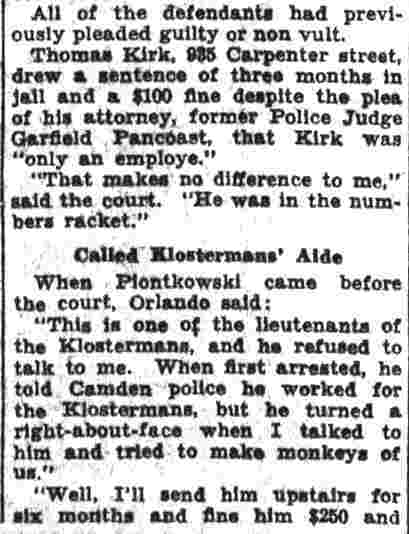 First, because no sergeant-at-arms has the power to hold up a court order and second, because he was engaged in an argument in a public office, during which he used profane language”. 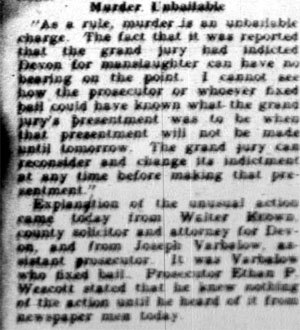 Herbert Richardson, counsel for Martin, would not discuss the case today. "I don't know what it is all about as yet, so naturally I have nothing to say. I feel that the matter will straighten itself out," Richardson said. 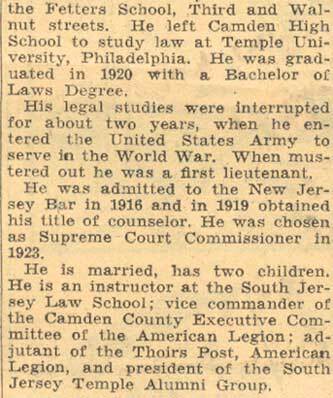 When Henry F. Chmura, 11, of 1245 Kaighn Avenue, grows up he may become a member of the United States Supreme Court. Well, anyway, Henry. demonstrated in the City District Court today that he has a legal mind. The boy delivered one of the snappiest legal arguments ever heard in that courtroom. 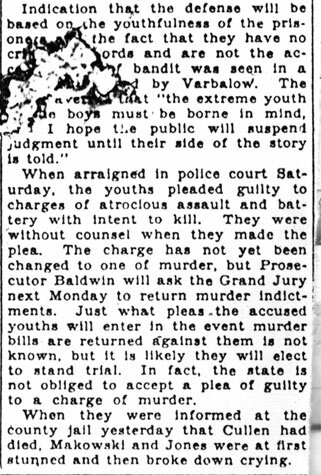 Judge Joseph Varbalow and a score of attorneys sat with opened mouths listening to the youth plead his case in a damage suit in which he was the plaintiff. It appears from what Henry told the court. 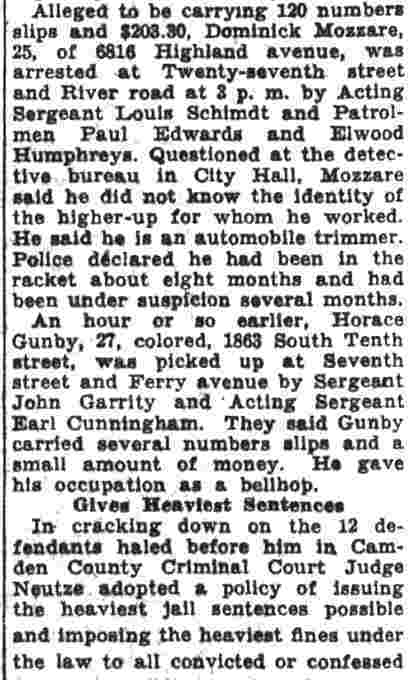 that on September 19, 1934, he purchased a ticket to enter a Parkside motion picture theatre. He ran into the theatre after depositing his ticket in the box. The manager of the theatre saw him run in and went after him, thinking that the boy had "sneaked in"' according to suit papers. He grabbed the boy who struggled, and the youth's head banged against a wall knocking him unconscious, the suit stated. 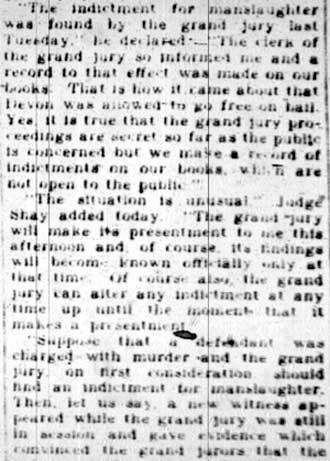 His mother, Mrs. Anna Chmura, through her attorney, Samuel T. French, brought suit against the theatre in the district court. The boy sought $300 damages and his mother $200 damages. The case was listed for trial Wednesday but in the interim a settlement was suggested between the opposing parties. The attorneys, Mrs. Chmura and her son appeared before Judge Varbalow. One of the attorneys told the court that a settlement had been reached for $200 and asked to have the case dismissed. 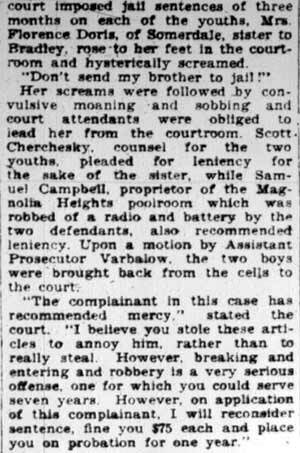 Judge Varbalow asked Mrs. Chmurs: "Is the amount of the settlement for your son satisfactory to you?" 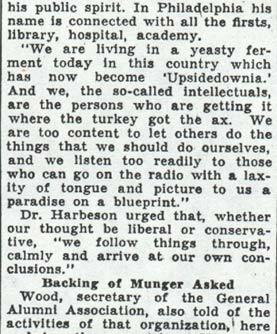 "It certainly is," the woman replied. "How about you, Henry?" the court asked, "are you satisfied to get the $200?" "Your Honor, the amount of the settlement may be satisfactory to my mother, but it certainly is not to me. When my head banged against that wall it felt as if 500 pounds of. iron fell on me. I still have headaches from it." "Well, why don't you think $200 is a proper settlement?" asked the court. "What are you going to be when you grow up to be a man?" the court asked. "I want to be a lawyer," the lad replied. "I'll make a bet you reach the United States Supreme Court," the judge replied. 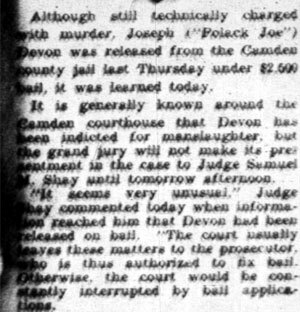 The court then held up the settlement until and unless he receives a letter from the boy's physician stating he is in perfect health. If such a letter is received the settlement will stand. 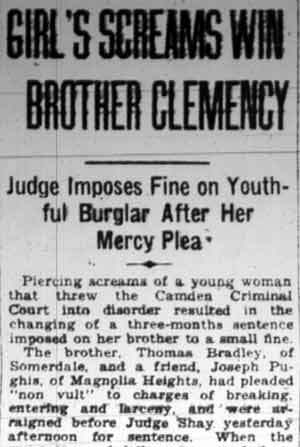 If Henry is not satisfied with the decision' he can carry his appeal to the Court of Common Pleas. The City District Court literally went to the dogs yesterday. And that is no joke with District Court Judge Joseph A. Varbalow, who is being called upon for a Solomon judgment in a case involving a half-dozen champion Boston terriers, two well-known Camden county families, a claim for $190 and a counter-claim for $212.50. 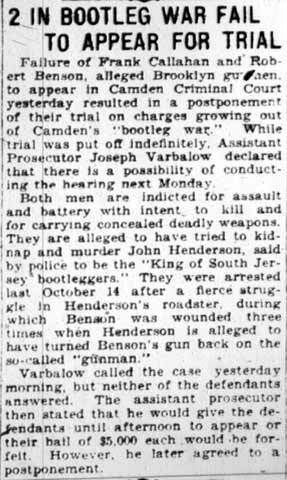 Mrs. Bertha Denny, wife of former Coroner Benjamin Denny, brought the original suit against Mr. and Mrs. Alfred Thomas of 300 Cuthbert Road, Haddon Township. Mrs. Denny resides at 736 Market Street. She contends she sold to the Thomas' pair several champion dogs during 1936, for which she was to receive $440. She said she has received $250 and that there is a balance of $190, which Mr. and Mrs. Thomas refuse to pay. In a counter suit the Thomas family asks $212.50, which they claim is owed to them for board for three dogs they kept at their kennels for Mrs. Denny, one dog remaining four weeks, another for 11 weeks and a third for 32 weeks. 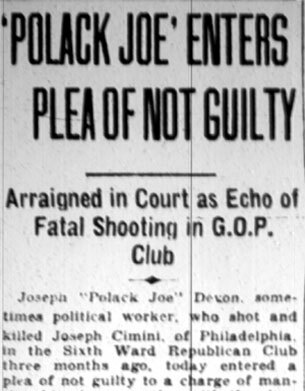 Such fancy names as ''Pretty Girl” and "See-Me-Hagerty," to say nothing of "Pal-Mino-Joy" seemed to further confuse the judicial issue as Judge Varbalow struggled to reach an amicable decision. 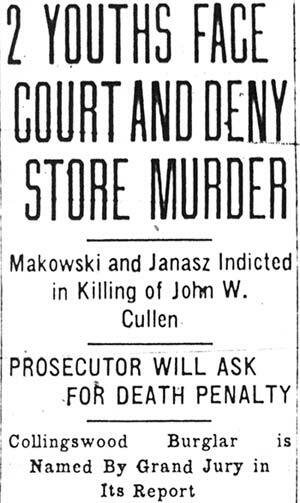 The case continued throughout the day. A legal battle over the county solicitorship loomed yesterday following a caucus of Democratic members of the Board of Freeholders Thursday. A decision to name Vincent L. Gallaher, chairman of the Democratic County Committee, to the post at next Wednesday's regular meeting of the board reportedly was reached by the caucus. 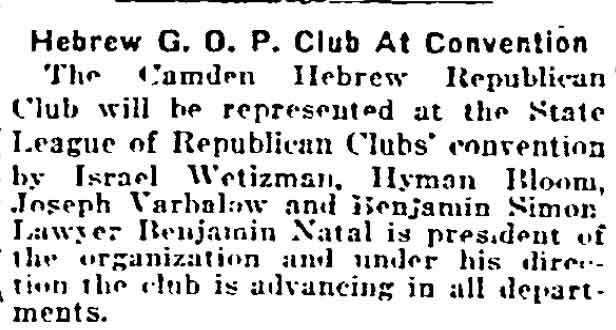 However, Walter S. Keown, Republican counsel, said yesterday he feels his job is "secure legally," pointing out that he was appointed January 1, 1937; to a three-year term. Keown denied reports that have been circulating for weeks through the municipal and county buildings that he will resign. "There is absolutely no foundation to such rumors," Keown said today. "I have no intention of resigning and I know of no legal technicality that will permit a successor to be named." "I don't like to answer 'if' questions. But you can say for me that I feel my job is secure legally. I don't know of a thing on which they could base an attempt to dismiss me. 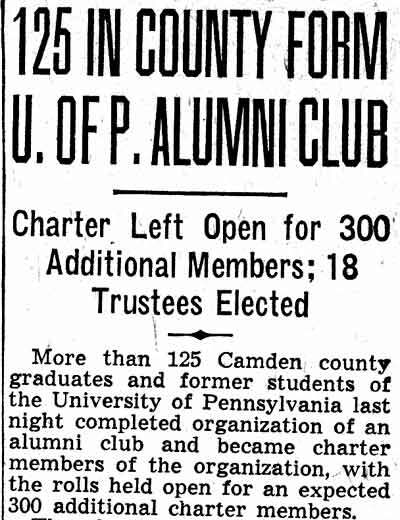 "Don't forget, too, that most of the present members of the board were in office when I was reappointed last year." The position pays $5000 in annual salary, less 15 percent economy salary reductions. Last year Keown actually received $4250 in salary, $1287.50 for office expenses and $200 for other expenses. Thursday's meeting was held at the home of District Court Judge Joseph Varbalow. 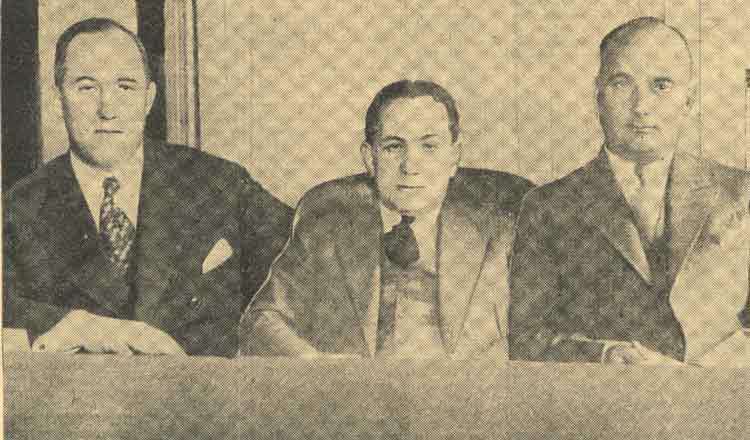 A group of Democratic freeholders were at the meeting, which was attended also by Edward V. Martino and Isadore H. Hermann, lieutenants of Commissioner Mary W. Kobus and members of the city legal staff. 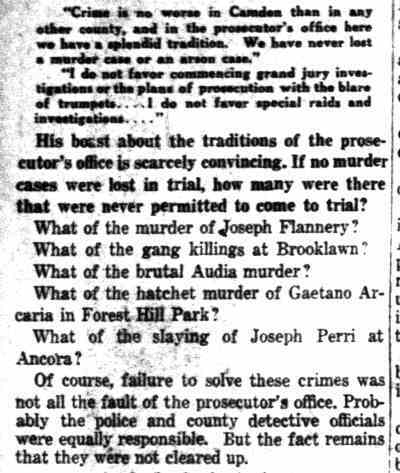 Mrs. Kobus and Mayor George E. Brunner appeared at the Varbalow, home after the meeting had been adjourned. 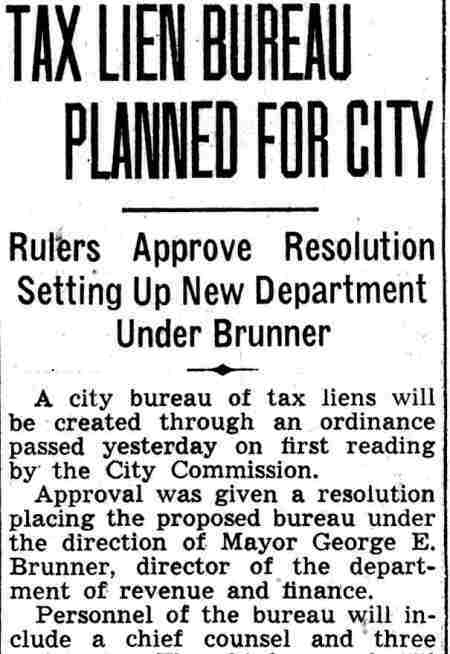 Freeholder Maurice I. Bart, of Oaklyn, majority leader of the Board of Freeholders, said the caucus was ready to cut the county budget by $77,000 to bring the 1938 county tax rate down to the 1937 level of 80 cents from its present level of 83.5 cents. "That's against my wishes and advice," Bart said "but seems to be in line with the desires of Dr. W. Carlton Harris; who has just been named as county fiscal advise" Bart said, the Democratic freeholders agreed to lop $8000 off the county farm appropriation to eliminate the chicken farm. 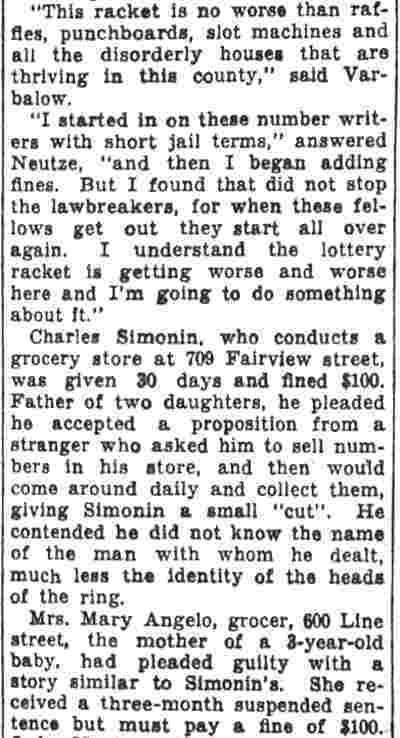 He said the 1936 records showed eggs were produced for county institutions at $1.65 a dozen, when they could have been bought for 35 cents a dozen. He announced the freeholders practically agreed to refuse to add an insulin therapy department to the mental hospital and said this would cut the budget about $15,000 .
. "The rest of the cuts will be effected by slashes all along the line of departmental, appropriations," Bart announced. Bart said the Democratic freeholders revolted against payment of a bill of $2207.86 submitted by J. C. Remington, consulting engineer for the county park commission, and his partner, for consulting fees in connection with the recent improvement of the county sewage disposal plant at Lakeland. "We have paid that firm - Remington and Goff- $4440.80 already, and this new bill came to my attention only today,” Bart said. 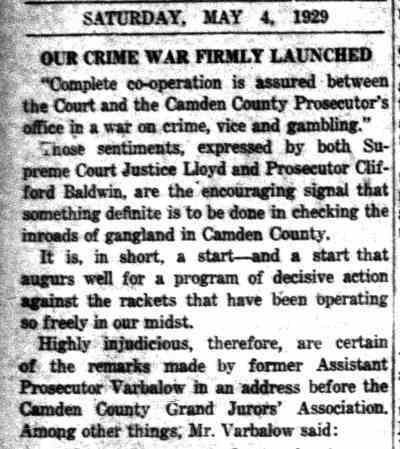 The caucus also entertained a request by prosecutor Samuel P. Orlando that the three process servers transferred from the prosecutor's office to the sheriffs office during the term of Judge Clifford A. Baldwin as prosecutor be returned to the prosecutor's office to effect efficiency, Bart said.